It was the wrong day to be impulsive. With several very good options of shows to go to in St. Joseph on the same night I found myself in limbo. 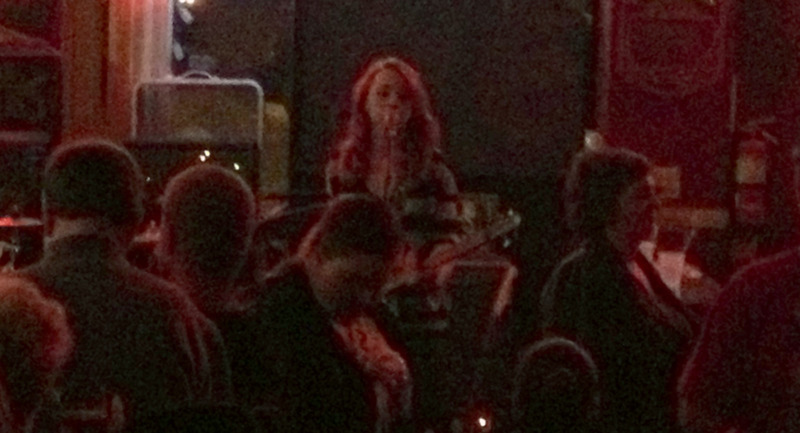 By the time I decided that I would be a fool not to go see Samantha Fish at Magoon’s, it was apparently already late. I didn’t miss any music and I made the 9:00 start time. What happened is that I would face the brunt force of possibly the largest crowd I have ever seen for a St. Joe bar show. Samantha Fish may be from just over an hour down the road, in Kansas City, but she is a nationally recognized act. She is an award-winning blues guitarist and the cold weather didn’t prevent any of the local crowd from coming out to see her. Having played Magoon’s before, she had built a reputation within the city limits in person already and only increased her status in Jesse James’ hometown with her show on February 1st. With a $10 cover charge at the door, this may have been the most impressive crowd I’ve seen, people were stuffed in every crevice of the bar and there was little room to jostle for a spot to see the young songstress anywhere. Samantha Fish performs to a packed crowd at Magoon’s in St. Joseph, Missouri on 2/1/13. The crowd was unique for this show as well. At the alarmingly young age of 22 years old, Fish was about half the age of many of the people in the crowd she drew. While the age range did vary, there were a lot of bald heads and grey hairs among the roughly 130 people in attendance. Samantha Fish’s music is not limited to her age range as many artists are. With her incredibly heavy classic blues influence this makes perfect sense and came as no surprise. Many people would quietly tap their feet and nod their head to the music while not even trying to see Fish who was positioned by the front door. Standing at ground level it was tough to see her. What the audience did get was the roar of the three piece band topped off with Fish’s powerful vocals. Her guitar playing was superior (obviously) and it was really a shame most of the people couldn’t see Fish’s fingers sliding up and down the neck of her ax. An excited member of the audience would frantically tap his friends on the arms exclaiming “She’s gonna play a cigar box!” as she started to whale on the surprisingly great sounding 4-string instrument. Her style of singing may have been the most impressive thing on the night. Her strong, proud and confident vocals soared above the well defined rumble of music made by her guitar, Chris Alexander’s bass and the flashy drumwork of Go-Go Ray. Her vocals were so proud and confident that it took away much of the sultry sexiness of her vocals that is present on her recordings. She is less of an innocent siren and more of a brute force to be reckoned with on stage. Samantha Fish has the fiery passion that makes the blues what it is. Drenched in the history of the blues, she channeled the ghosts of those who came before and kept the train rolling for those who will come after her. Her songs ranged from R&B grooves like on “You Ain’t Foolin’ Me” to the down home stomping boogie-funk of “Killing Floor.” Fish’s fiery red hair and pretty face were obviously not the only things she had going for her. She has the guitar skills to go up against almost any blues guitarist and the vocals to match. Even when she slowed the pace of the show to cover the Rolling Stones classic “Wild Horses” she managed to keep the very large crowd reeled in. She has a couple albums out and are available to buy. She had a merch table with them at the show but was charging $20 for a cd. This really bothered me; I mean the Rolling Stones don’t charge $20 for a cd. I’m sure her sales numbers are greatly effected by this and she is really hurting herself by charging this much for them. If they were $10-$15 (as they should have been) more copies would move and more people would be familiar with her music and probably share it with their friends, creating larger crowds at the shows. Her skills are undeniable though and she is a fantastic live performer and that is ultimately why she has came as far as she has and drew this impressive crowd on a cold February night. Anybody who made it to Magoon’s for this show should consider themselves lucky; venues this small won’t hold her music for much longer. This entry was posted in Concert Review and tagged 2/1/13, blues, concert review, live show, Magoon's, Magoon's Famous Delacatesson, Missouri, overpriced cds, Runaway, Samantha Fish, St. Joseph. Bookmark the permalink.